For the cut of beef, see skirt steak. For filter band edge, see skirt (filtering). For the Kylie Minogue song, see Skirt (song). A skirt is the lower part of a dress or gown, covering the person from the waist downwards, or a separate outer garment serving this purpose. The hemline of skirts can vary from micro to floor-length and can vary according to cultural conceptions of modesty and aesthetics as well as the wearer's personal taste, which can be influenced by such factors as fashion and social context. Most skirts are self-standing garments, but some skirt-looking panels may be part of another garment such as leggings, shorts, and swimsuits. In the western world, skirts are more commonly worn by women; with some exceptions such as the izaar which is worn by Muslim cultures and the kilt which is a traditional men's garment in Scotland and Ireland. Some fashion designers, such as Jean Paul Gaultier, have shown men's skirts. 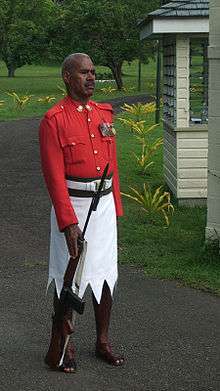 Other cultures traditionally wear skirts. At its simplest, a skirt can be a draped garment made out of a single piece of material (such as pareos), but most skirts are fitted to the body at the waist or hips and fuller below, with the fullness introduced by means of darts, gores, pleats, or panels. Modern skirts are usually made of light to mid-weight fabrics, such as denim, jersey, worsted, or poplin. Skirts of thin or clingy fabrics are often worn with slips to make the material of the skirt drape better and for modesty. A straw-woven skirt dating to 3900 BC was discovered in Armenia at the Areni-1 cave complex. Skirts have been worn by men and women from many cultures, such as the lungi, lehnga, kanga and sarong worn in South Asia and Southeast Asia, and the kilt worn in Scotland and Ireland. The earliest known culture to have females wear clothing resembling miniskirts were the Duan Qun Miao (短裙苗), which literally meant "short skirt Miao" in Chinese. This was in reference to the short miniskirts "that barely cover the buttocks" worn by women of the tribe, and which were "probably shocking" to observers in medieval and early modern times. In the Middle Ages, some upper-class women wore skirts over three metres in diameter at the bottom. At the other extreme, the miniskirts of the 1960s were minimal garments that may have barely covered the underwear when seated. Costume historians typically use the word "petticoat" to describe skirt-like garments of the 18th century or earlier. During the 19th century, the cut of women's dresses in western culture varied more widely than in any other century. Waistlines started just below the bust (the Empire silhouette) and gradually sank to the natural waist. Skirts started fairly narrow and increased dramatically to the hoopskirt and crinoline-supported styles of the 1860s; then fullness was draped and drawn to the back by means of bustles. In the 1890s the rainy daisy skirt was introduced for walking or sportswear. It had a significantly shorter hemline measuring as much as six inches off the ground and would eventually influence the wider introduction of shorter hemlines in the early 20th century. Beginning around 1915, hemlines for daytime dresses left the floor for good. For the next fifty years fashionable skirts became short (1920s), then long (1930s), then shorter (the War Years with their restrictions on fabric), then long (the "New Look"), then shortest of all from 1967 to 1970, when skirts became as short as possible while avoiding exposure of underwear, which was considered taboo. Since the 1970s and the rise of pants/trousers for women as an option for all but the most formal of occasions, no one skirt length has dominated fashion for long, with short and ankle-length styles often appearing side-by-side in fashion magazines and catalogs. Culottes, a form of divided skirt constructed like a pair of shorts, but hanging like a skirt. Ballerina skirt, a mid-calf full skirt popular in the 1950s. Bubble dress/skirt, a voluminous skirt whose hem is tucked back under to create a “bubble effect” at the bottom. Cargo skirt, a plain utilitarian skirt with belt loops and numerous large pockets, based on the military style of Cargo pants and popularised in the 1990s. Crinoline, a very full skirt supported by hoops or multiple petticoats, popular at various times from the mid 19th century onwards. Denim skirt (or jeans skirt), a skirt made of denim, often designed like 5-pocket jeans, but found in a large variety of styles. 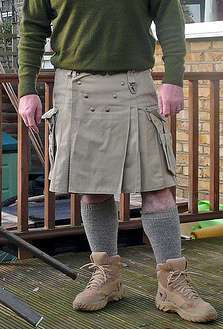 Kilt-skirt, a wrap-around skirt with overlapping aprons in front and pleated around the back. Though traditionally designed as women's wear, it is fashioned to mimic the general appearance of a man's kilt. Lehenga (also Ghagra; Garara ), a long, pleated skirt, often embroidered, worn mostly as the bottom part of the Gagra choli in North India and Pakistan. Micromini, an extremely short miniskirt. Mini-crini, a mini-length version of the crinoline, designed by Vivienne Westwood in the mid 1980s. Puffball skirt (also called "puff" or "pouf"), a bouffant skirt caught in at the hem to create a puffed silhouette. Popular in the mid-late 1980s when it was inspired by Westwood's "mini-crini". Rah-rah skirt, a short, tiered, and often colourful skirt fashionable in the early-mid-1980s. Scooter skirt or skort (variant), a skirt that has an attached pair of shorts underneath for modesty. Alternatively, but with similar effect, a pair of shorts incorporating a skirt-like flap across the front of the body. Skater skirt, a short, high-waisted circle skirt with a hemline above the knee, often made of lighter materials to give the flowing effect that mimics the skirts of figure skaters. T-skirt, made from a tee-shirt, the T-skirt is generally modified to result in a pencil skirt, with invisible zippers, full length two-way separating side zippers, as well as artful fabric overlays and yokes. Tiered skirt, made of several horizontal layers, each wider than the one above, and divided by stitching. Layers may look identical in solid-colored garments, or may differ when made of printed fabrics. Trouser skirt or cullotte, a straight skirt with the part above the hips tailored like men's trousers, with belt loops, pockets, and fly front. Long skirt, floor or near-floor length. Mid-calf length or 'midi,' a term introduced in the 1970s. 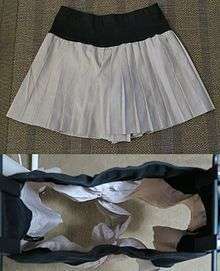 Microskirt, an extremely short miniskirt. High-low/hi-lo skirt, a skirt with an asymmetrical hemline. The fustanella is worn by men in Greece and other parts of the Balkans. By the mid-20th Century, it was relegated to ceremonial use and as period or traditional costume. 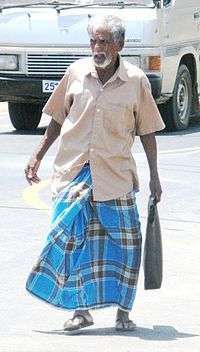 The sarong is a piece of cloth that may be wrapped around the waist to form a skirt-like garment. Sarongs exist in various cultures under various names, including the pareo and lavalava of the Hawaiian islands and Polynesia (Samoa, Tonga, Tahiti, and Fiji), the Indian dhoti and lungi, and the South Indian and Maldivian mundu. Aside from the wearing of kilts, in the Western world skirts, dresses, and similar garments are commonly considered primarily women's clothing – which, historically, was not always the case. ↑ "5,900-year-old women's skirt discovered in Armenian cave". News Armenia. September 13, 2011. Retrieved September 14, 2011. ↑ Harrell, Stevan (1995). Cultural Encounters on China's Ethnic Frontiers. University of Washington Press. pp. 98 & 103. ISBN 0-295-97528-8. ↑ Hill, Daniel Delis (2007). As seen in Vogue : a century of American fashion in advertising (1. pbk. print. ed.). Lubbock, Tex. : Texas Tech University Press. pp. 23–25. ISBN 978-0-89672-616-1. ↑ Yarwood, Doreen (2011). Illustrated encyclopedia of world costume. Mineola, N.Y.: Dover Publications, Inc. p. 376. ISBN 9780486433806. ↑ "Social Science a Textbook in History for Class IX as per New Syllabus". google.co.in. ↑ Staff writer. "Vivienne Westwood designs". Victoria and Albert Museum. Retrieved 5 June 2015. ↑ Evans, Caroline (2004). "Cultural Capital 1976–2000". In Breward, Christopher; Ehrman, Edwina; Evans, Caroline. The London look : fashion from street to catwalk. New Haven: Yale University Press / Museum of London. p. 149. ISBN 9780300103991. ↑ "Gho & Kira: The National Dress". Bhutan's Culture. RAOnline. Retrieved 31 July 2010. ↑ A closer look at men in skirts, CNN, November 3, 2003. Retrieved March 17, 2008. Look up skirt in Wiktionary, the free dictionary. Wikimedia Commons has media related to Skirts.